Bridge Bay, Canyon, Grant Village and Madison – have accessible campsites and rest rooms. Call the Amfac number listed above to reserve a site. Indian Creek, Lewis Lake, Pebble Creek, Slough Creek and Tower Fall – have accessible vault or pit toilets. Lewis Lake and Slough Creek Campgrounds have an accessible campsite. Camping for bicyclists or front country hikers is limited to the developed campgrounds located throughout the park. Campsites are available by reservation (through AmFac at 307-344-7311), and on a first-come, first serve basis. 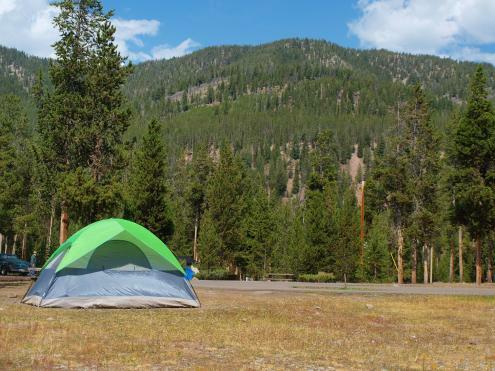 The distance separating campgrounds, and the fact that all of the park’s campgrounds typically fill early each day during the peak visitation season, will pose logistical problems for the bicycle or hiking camper in Yellowstone. A limited number of campsites are reserved for hikers and bicyclists at all campgrounds with the Exception of Slough Creek Campgrounds. Camping is Not Available at Old Faithful. If you are traveling with a large group of bicyclists or hikers, call AmFac prior to your arrival to check on group campsite availability. Not all campgrounds can accommodate large groups. If you have access to a vehicle, use it to find a campsite in your destination campground early each day. Bicyclists or hikers camping without a vehicle can use designated hiker/biker sites for $4.00 per individual per night. All other vehicular campsites range from $10.00 to $16.00 per night, depending on the facilities available. The opening and closing dates vary considerably for each campground in the park. Check the Calendar Page and/or Camping Page to make sure that a campground is open if you are planning a spring or fall visit to Yellowstone.